An article with the above title caught my attention this morning. “Innocent often fall victim to DUI laws” was published in the Picayune Item in Mississippi on August 24, 2011. The article makes many excellent points. There were 33,153 Mississippi DUI arrests last year, an astounding number. If DUIs were randomly distributed, every driver in the state would get at least one during his lifetime. A Colorado study showed that 20 percent of those arrested for DUIs had legal blood alcohol levels. The problem is that residual alcohol in your mouth can distort the results of the unreliable portable breathalyzers police often use to make an arrest. According the article, some of the problems that can be corrected by the legislature include eliminating DUI roadblocks, requiring officers to wait 20 minutes before conducting a portable breath test, allowing drivers to choose a more accurate blood test in lieu of a breath test, requiring police to save test samples for retesting by the defendant, and allowing defendants to videotape their encounters with police. Studies I have seen indicate that roadblocks are less effective than random patrolling for catching suspected drunk drivers. The 20 minute wait, blood test option, and allowing defendants to retest their blood or breath would make the process more fair to persons accused of DUI. And I agree that there should be no prohibition on videotaping encounters with police. In fact, South Carolina has a law requiring police to videotape all DUI arrests. Videotaping protects the citizen accused as well as the police officer against false claims. The article also recommends getting a portable breathalyzer, staying after dinner and waiting before driving, getting a designated driver, and sticking to one drink per hour. These are all good recommendations with the exception of the last one. The one drink an hour rule is deceptive because the average person metabolizes less than one drink an hour. That means that the blood alcohol level is slowly rising even with a one drink an hour rule. If you don’t weigh much, you will quickly get over the legal limit. And the one drink an hour rule also assumes a standard drink – either a 12 ounce beer, a 4 ounce glass of wine, or a drink containing 1 and 1/2 ounces of 80 proof alcohol. 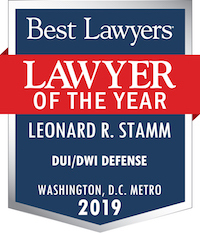 But if the one drink is a 20 ounce beer, a Martini, a Manhattan, a Long Island Iced Tea, or any other drink containing much more alcohol than the standard drink, this rule can quickly get you in trouble. Better advice is to limit yourself to two standard drinks for the night if you are going to drive. 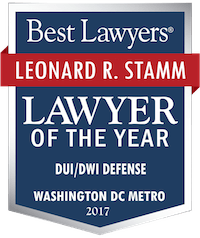 If you are facing serious traffic charges in Maryland state or federal court call Leonard R. Stamm or Johanna Leshner of Goldstein & Stamm, P.A. at 301-345-0122 for a free consultation.